I am a firm believer that animals have more capabilities than their people give them credit for. This book shows how a dog that thought of himself as a failure worked hard to find a new purpose in life. Chester was trained to be a service dog, but after he failed his certification because he hates out noises, he thought he'd never get another chance. 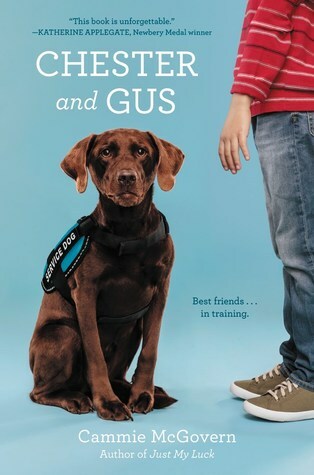 When a family comes along in search of a friend for their autistic son, Gus, Chester bring it upon himself to help this boy like he knows he can. After a lot of time spent observing the boy, Chester learns the dos and don'ts of life with Gus. Don't make too much noise. Don't get too close to him. Don't lick him. Don't ask too many questions. That's right. Chester finds himself bonded to this boy in such a way that he can't even describe it at first. Gus, who doesn't talk, seems to understand the things that Chester asks him and he answers back (some of the time). Using this new tool for communication, Chester gets Gus to trust him because he needs him now more than ever. But Chester has just been told he's not allowed in school anymore because he's not a certified service dog. Strange things have been going on with Gus lately and it all comes to a head once the fire alarms go off at school. Being frightened at first, Chester loses track of Gus but forces his way to his boy. He finds Gus passed out in a closet and Gus is taken to the hospital for a few days. Now Chester has a renewed sense of responsibility for the boy and their relationship changes daily. Can Chester be the dog that Gus needs him to be? Sign into Goodreads to see if any of your friends have read Chester and Gus.